8) Walt Disney’s Carousel of Progress – Another wonderful show based in a theater is the perfect experience to enjoy in the Magic Kingdom’s Tomorrowland. The area of the park is always busy thanks to the popular Buzz Lightyear’s Space Ranger Spin and Space Mountain, however crowded days can make the area seem way too over-packed. A great way to avoid the crowds in Tomorrowland is visiting Walt Disney’s Carousel of Progress which is housed in a revolutionary theater. The attraction originated at the 1964 New Yrk World’s Fair and invites guests to sit down and enjoy the story of an American family as they experience progress and its conveniences throughout a century. After a brief introduction, guests will be amazed at how the theater itself rotates around a central stage to the first scene of the turn of the century. Each scene shows the family in their home and explains how the innovative breakthroughs and inventions of the times made life easier at home and on the go. Guests are sure to love watching the progress of the family as well as signing along to the catchy and popular song “There’s A Great Big Beautiful Tomorrow” at the end of each scene. 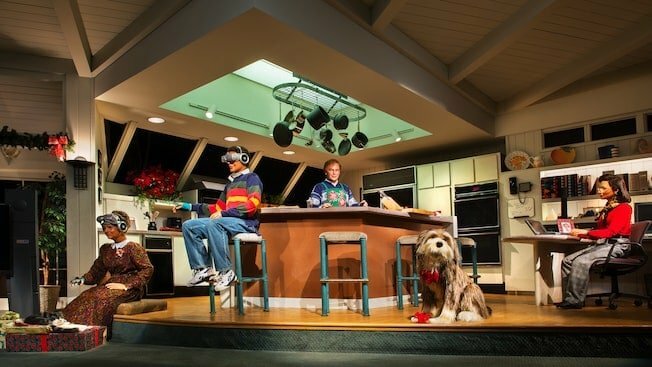 Walt Disney’s Carousel of Progress is an attraction that cannot be skipped on any visit to the Magic Kingdom.